The Handbook of Medicinal Plants explores state-of-the-art developments in the field of botanical medicine. Nineteen experts from around the world provide vital information on natural products and herbal medicinesfrom their earliest relevance in various cultures to today’s cutting-edge biotechnologies. Educated readers, practitioners, and academics of natural sciences will benefit from the text’s rich list of references as well as numerous tables, figures, and color photographs and illustrations. 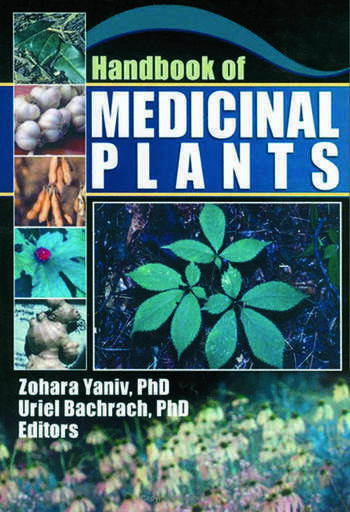 The Handbook of Medicinal Plants is divided into three main sections. The first section covers the use of herbal medicines throughout history in China, Australia, the Americas, the Middle East, and the Mediterranean, emphasizing the need for future medicinal plant research. The second section discusses the latest technologies in production and breeding, crop improvement, farming, and plant research. The third section focuses on groundbreaking advances in the medicinal application of therapeutic herbs. The Handbook of Medicinal Plants demonstrates the global relevance of sharing local knowledge about phytomedicines, and highlights the need to make information on plants available on a worldwide basis. With this book, you can help meet the challenge to find scientifically rationalized medicines that are safer, more effective, and readily available to patients from all walks of life.